AMOS RICHARD DEASE was born in Pennsylvania in August of 1842 to Henry and Mary Dease. His father worked as a hatter. The Dease family lived in the North Ward of Reading, Pennsylvania when the census was taken in 1850 and 1860. 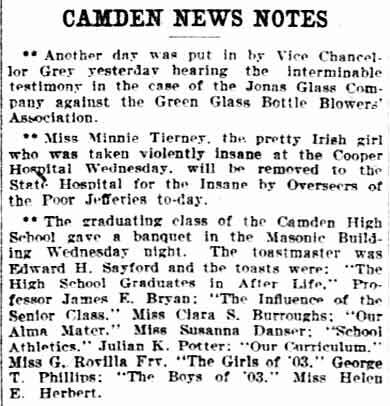 Amos Dease was one of nine children, the others being George, twins Henry and William, twins Aaron and Jacob, John, Emma, and Miller Dease. When the Civil War came, Amos Dease served in the Union Army. He enlisted as a Private on August 14, 1862 in Company E, 128th Pennsylvania Infantry Regiment. 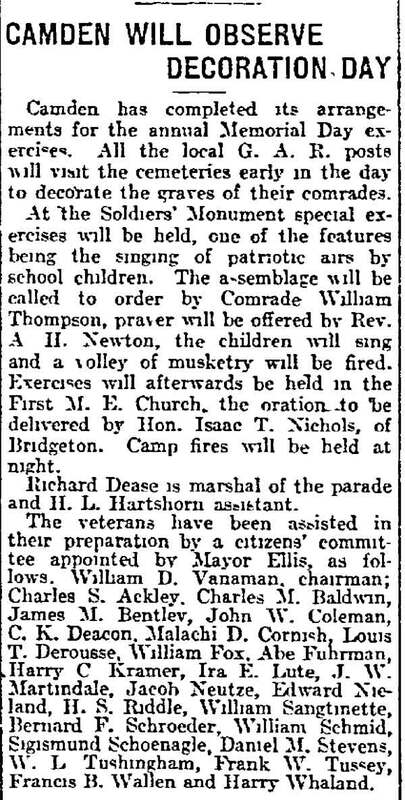 The 128th regiment was mustered in at Harrisburg, August 13 to 15, 1862, for nine months, most of its members having been recruited in Berks County and the remainder in Lehigh and Bucks counties. 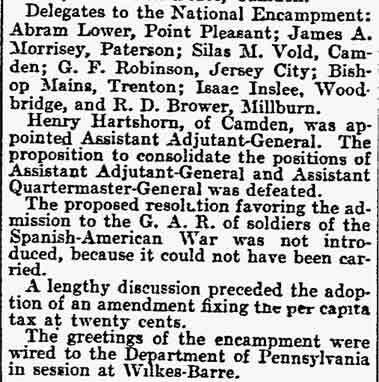 On Aug 16, the 128th Pennsylvania moved to Washington, encamped at Arlington Heights, Fairfax Seminary and Fort Woodbury and was occupied in erecting fortifications at the last-named place. Attached to the brigade under Col. Crawford, Williams' division, Mansfield's corps, the regiment was active at Antietam, losing heavily. During the next two months it was encamped at Sandy Hook and Maryland Heights with the 12th Corps, under command of General Williams, who succeeded General Mansfield after the battle of Antietam, in which Mansfield was severely wounded. The 12th Corps arrived too late to participate in the battle of Fredericksburg and encamped at Fairfax Station until in January, 1863, when it participated in the "Mud March." The remainder of the winter was spent at Stafford Court House and camp was broken late in April 1863 for the Chancellorsville movement. The 128th fought at the left of the line on May 2 and during the night, on returning to a position previously occupied, but then in the hands of the enemy, nine officers, including Colonel Mathews and Lieutenant Colonel Smith, and 225 enlisted men, were taken prisoner. The remainder of the regiment was closely engaged on the following day and after the battle was over but 172 men reported for duty at Stafford Court House. The regiment was mustered out at Harrisburg on May 19, 1863, the prisoners having been exchanged. Private Dease was among those who mustered out of Company E, 128th Pennsylvania Infantry Regiment on May 19, 1863 at Harrisburg. 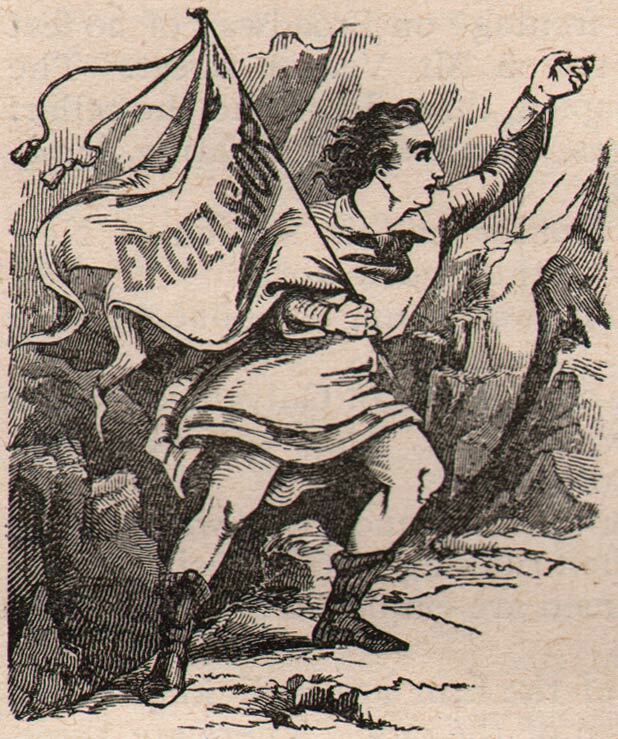 He returned to his home and family in Reading, and stayed in reading through July, 1870. 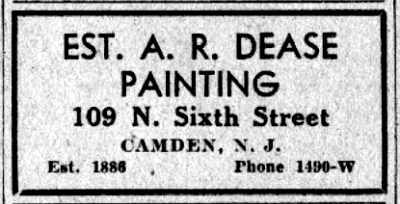 Amos Dease subsequently moved to Camden, New Jersey with his wife Emma and daughter Maggie and went to work as a painter. 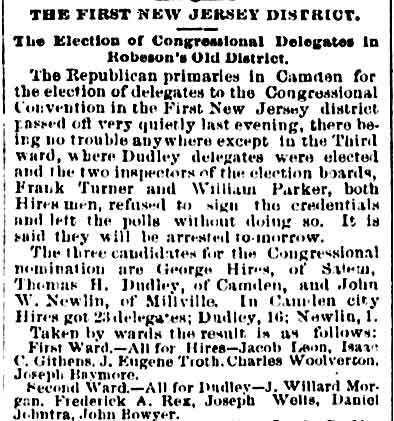 The Dease family was in New Jersey by 1872 when daughter Mary was born. 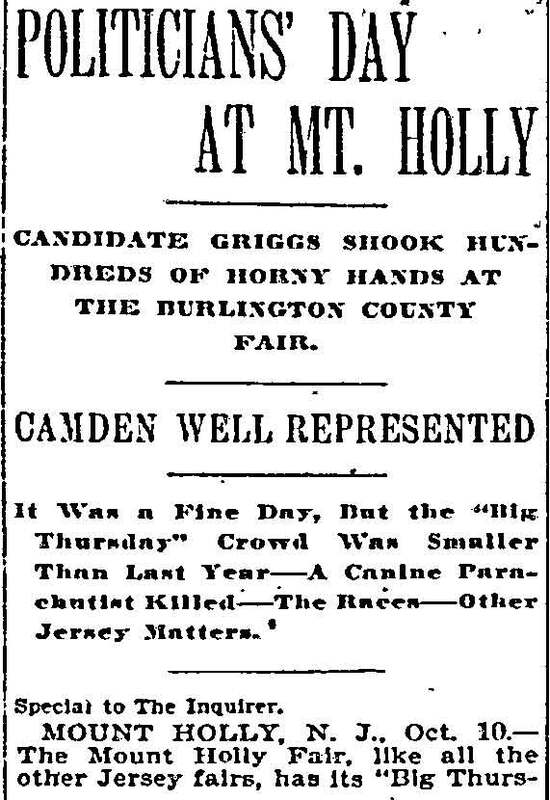 By June of 1880 there were three more children, Harry, Walter, and William Dease. Camden Fire Department records show that Amos R. Dease was living on Newton Avenue, but do not give a house number. 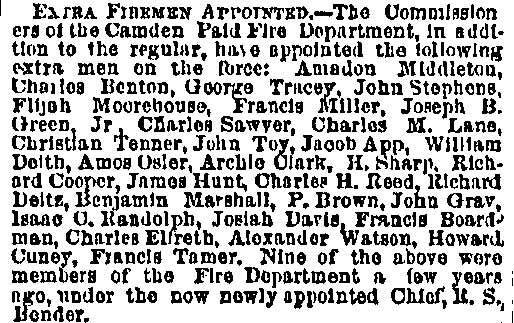 Amos R. Dease was appointed to the Camden Fire Department as an extra man with Engine Company 1 on May 8, 1877 taking the place of Asa V. Borton. He was removed from service of April 1, 1879, and was replaced by Howard Sharp. 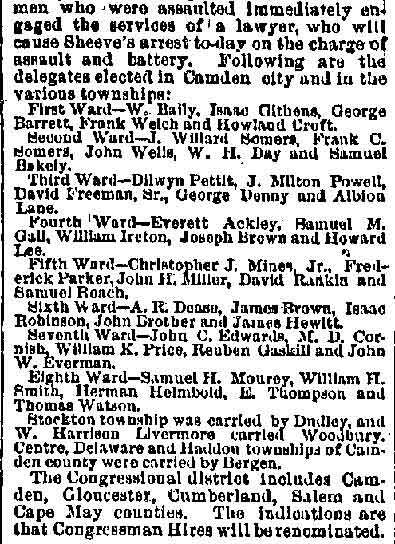 The 1878-1879 City Directory gives his address as 939 Newton Avenue. From City Directories we know that he had moved to 911 Reese Street by 1882. Reese Street was renamed St. John Street by the time the 1884 Camden City Directory was compiled. The Dease family remained at 911 St. John Street through at least 1885. 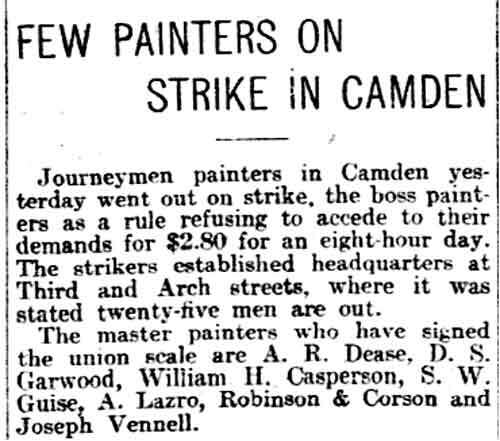 Amos R. Dease had worked for others as a painter, including Mahlon Ivins Sr. 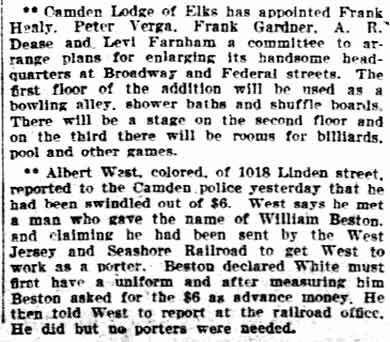 In late 1884 or early 1885 he went into business for himself, with former Camden Fire Department member Nesbert Y. Sloan as a partner, at 416 Market Street. The venture was called, appropriately enough, Dease & Sloan. After six months the partnership had dissolved due to illness on the part of Mr. Sloan, and Amos R. Dease carried on at 416 Market Street into the next century. 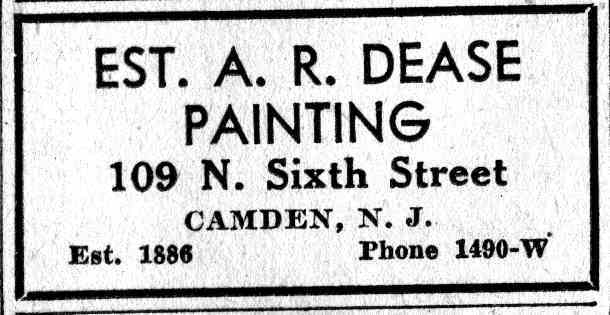 Amos R. Dease had moved to 714 South 4th Street by the end of 1887. 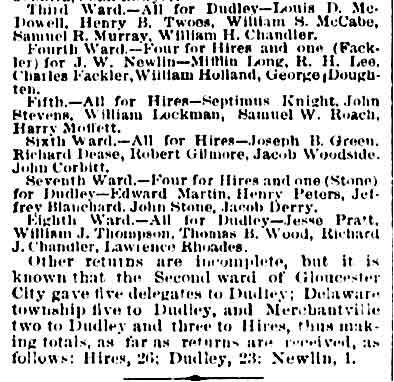 The 1890-1891 City Directory shows that he had moved to 414 Berkley Street, where he remained through 1894. By 1896 the Dease family had moved to 437 Stevens Street. 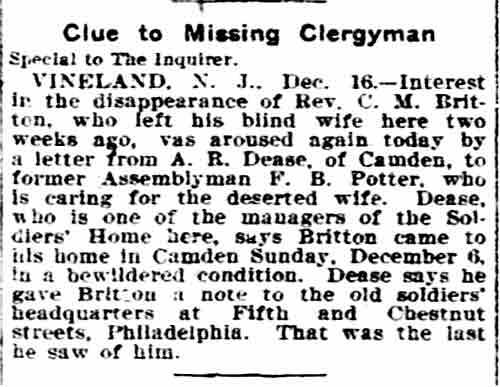 This address was Amos R. Dease's home until his passing on January 7, 1916, at the age of 73. 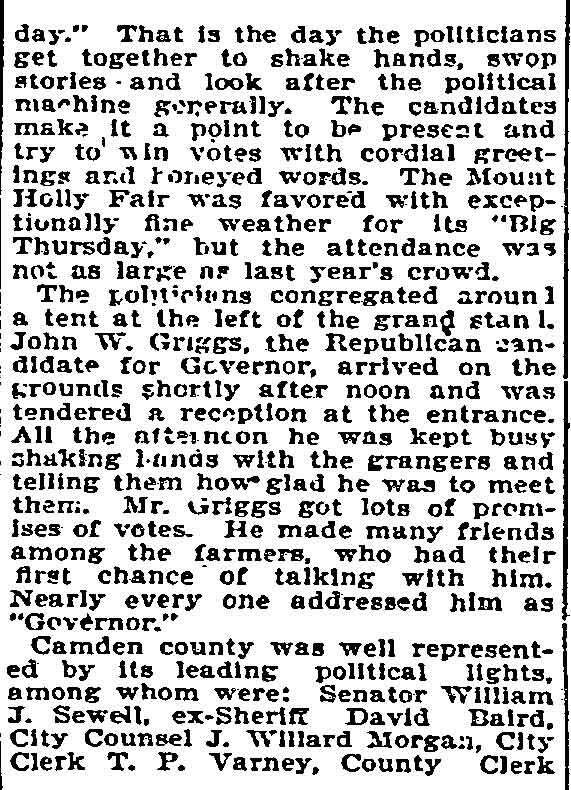 Amos R. Dease also became active in politics, as a Republican, and was active in civic and fraternal organizations. 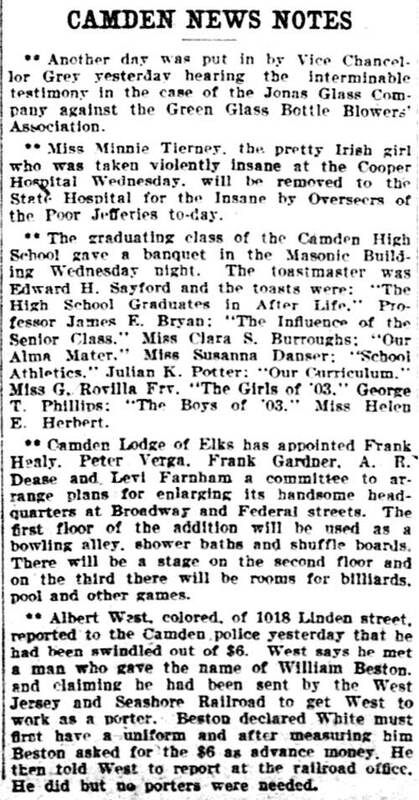 He was a member of Camden Lodge 293 of the Elks, Trimble Lodge No. 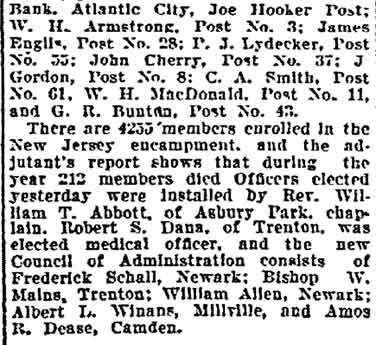 117, Free and Accepted Masons, the William B. Hatch Post No. 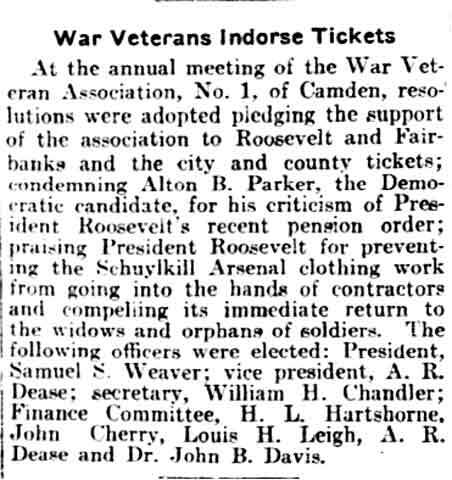 37, Grand Army of the Republic, and the War Veterans Association No. 1 of Camden. 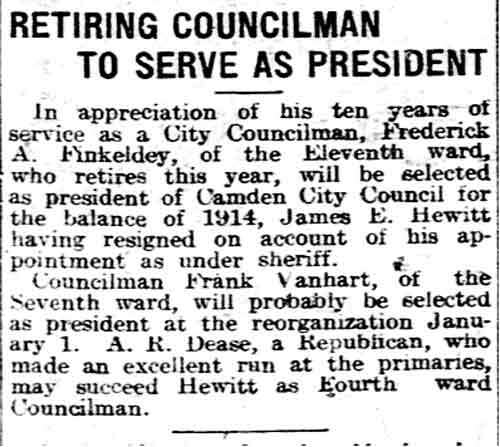 He served as a member of City Council from the Fourth Ward and at least once ran as a candidate for Camden County freeholder from Camden's Fourth Ward. 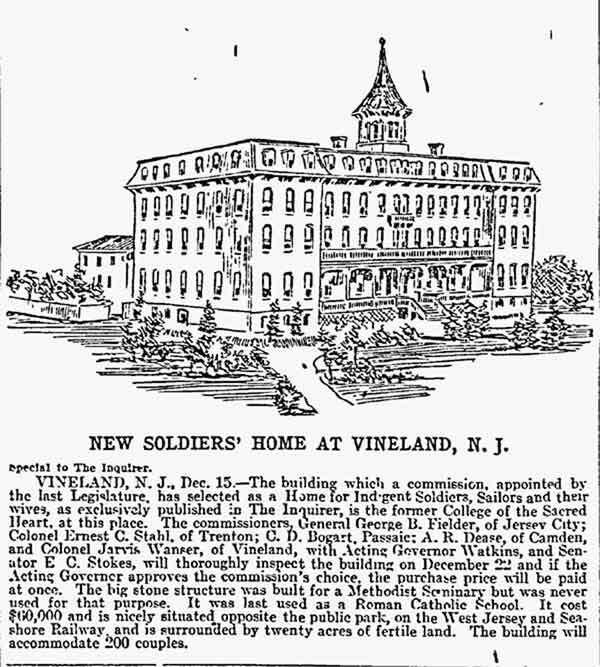 Amos Dease's most lasting work was his participation in the founding and administration of the New Jersey Home for Disabled Soldiers, Sailors, Marines and their Wives, or Widows which first opened at Vineland, New Jersey in 1900. 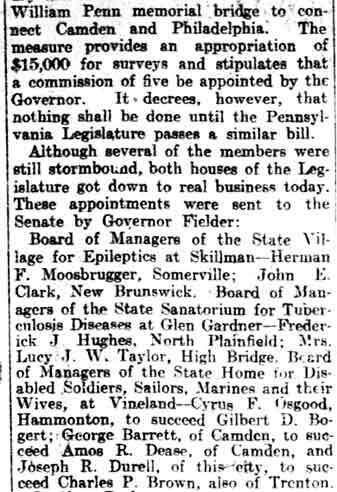 In August of 1898 he was appointed to a commission to look into the feasibility of such a home by then-Governor Foster M. Voorhees, for whom Voorhees Township is named. 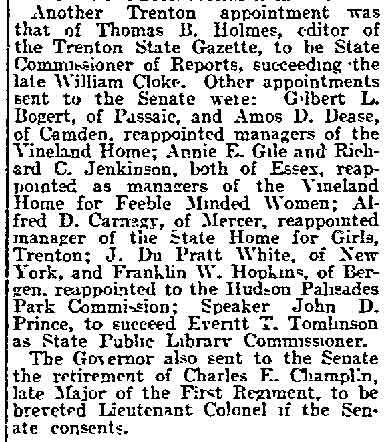 Once the Home went into operation, Amos R. Dease served on its Board of Managers until 1914. 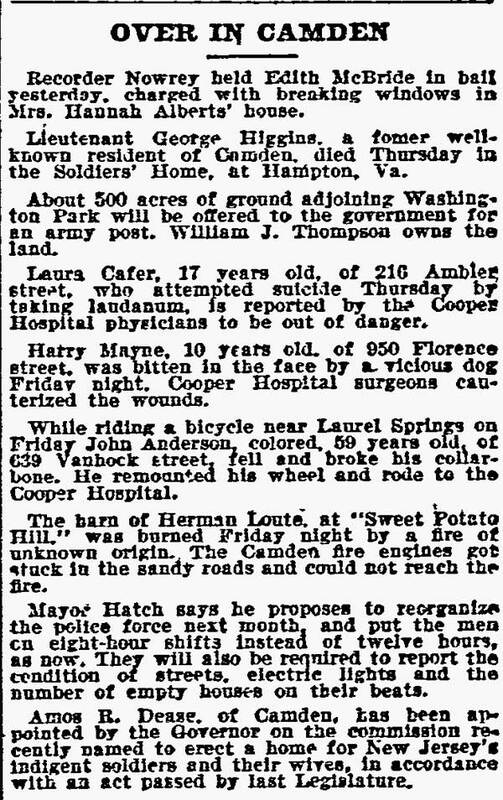 As stated above, Amos R. Dease passed away on January 7, 1916 at the age of 73. 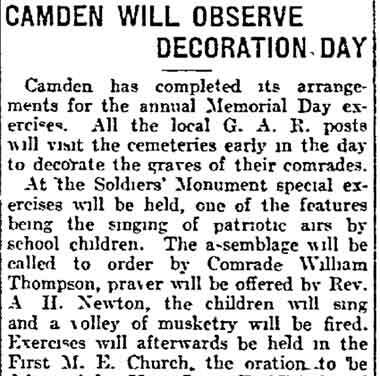 He was buried at Evergreen Cemetery in Camden..
History of Camden County, N.J.
Post Commander, John E. Grubb ; Senior Vice-Commander, Richard J. Robertson; Junior Vice-Commander, Daniel J. Fullen ; Surgeon, Thomas G. Rowand, M.D. 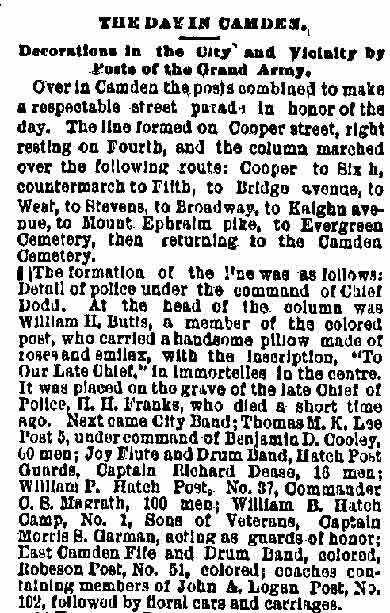 ; Chaplain, John Quick ; Officer of the Day, John A. Dall; Officer of the Guard, Edmund G. Jackson, Jr.; Quartermaster, Christopher J. Mines, Jr.; Adjutant, Benjamin J. Pierce; Sergeant-Major, William A.Tattern; Quartermaster-Sergeant, William B. E. Miller. It will afford me much pleasure to be identified with Post 37, G. A. E., named in honor of my son, William B. Hatch, by allowing me to present to the same its colors. The memory of my son is ever dear to me, and, while at the same moment I may have thought the sacrifice too great an affliction, yet I was consoled by the fact that I gave him up that this Union might be preserved. It was duty and patriotism that called him, and while I mourn him as a mother for a well-beloved son, yet I would not have stayed him, for the love of country and the upholding of this glorious Republic is what every mother should instill into her sons, as the purest and holiest spirit. Post Commander, Benjamin H. Connelly; Senior Vice-Commander, Adam C. Smith ; Junior Vice-Commander, William Haegele; Surgeon, George Pfau ; Chaplain, Samuel Gaul; Officer of the Day, Robert Crawford ; Officer of the Guard, John D. Cooper; Quartermaster, Samuel J. Fenner; Adjutant, William B. Summers; Sergeant-Major, Stacy H. Bassett; Quartermaster-Sergeant, Otto K. Lockhart. 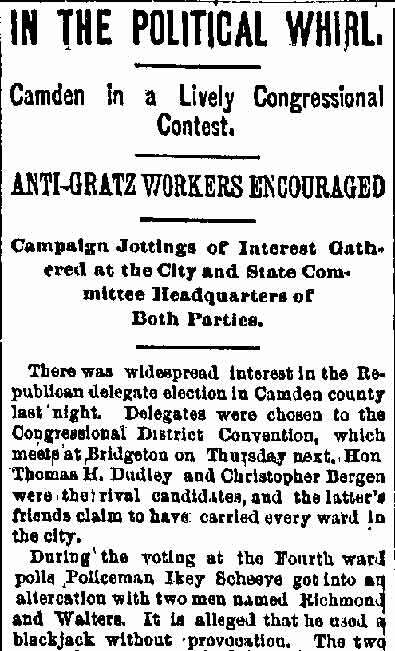 Comrades: Philip Achenbach, George L. Allchin, Isaac Albertson, Joseph Applegate, John W. Barclay, Martin M. Barney, Joseph Baxter, William W. Bennett, Charles L. Bennett, Henry Bickering, Abel Biddle, George K. Biddle, John Bieri, Robert M. Bingham, Socrates T. Bittle, George W. Bittle, Benjamin F. Blizzard, Joseph Borton, Frederick Bowers, Benjamin M. Braker, John Breyer, William H. Brians, Wm. J. Broadwater, William Broadwater, John Brown, Harris Brooks, William H. Brooks, Joseph F. Bryan, Joseph Buddew, J. Q. Burniston, George Burton, Frederick Buser, Thomas L. Bush, William Butcher, Isaac B. Buzby, Edward C. Cattell, Joseph Cameron, James H. Carey, William Carey, James Chadwick, James Chafey, George M. Chester, James D. Chester, Lewis L. Chew, Henry S. Chew, John W. Churn, Andrew B. Cline, Charles Clarke, Samuel J. Cook, Levi E. Cole, John J. Collins, John C. Cooper, John W. Cotner, Thomas L. Conly, Harvey M. Cox, Jason S. Cox, Harris Crane, Charles Cress, Joel G. Cross, O. C. Cunningham, John A. Dall, John Dalby, John H. Damon, Westley Dare, John E. Dawson, Adam T. Dawson, James L. Davis, William Davis, Amos R. Dease, Henry Deford, Lewis F. Derousse, Michael Devinney, Glendora Devo, John Digney, Joseph Dilks, William A. Dobbins, George W. Dunlap, Aaron B. Eacritt, John J. Early, Christopher Ebele, Godfrey Eisenhart, John Elberson, Charles Elwell, Charles Eminecker, John Esler, John H. Evans, Charles S. Fackler, James Fanington, James A. Farraday, John H. Farry, John Faughey, Wm. H. Fenlin, George G. Felton, George W. Ferguson, Charles W. Fish, Israel L. Fish, James Finnan, Samuel B. Fisher, Edward L. Fisher, Ephraim B. Fithian, Jacob T. Fisher, Edward Fitzer, Samuel Flock, Leonard Flor, John Fox, John S. Fox, H. H. Franks, Chas. B. Frazer, Thomas J. Francis, Samuel W. Gahan, Chas. 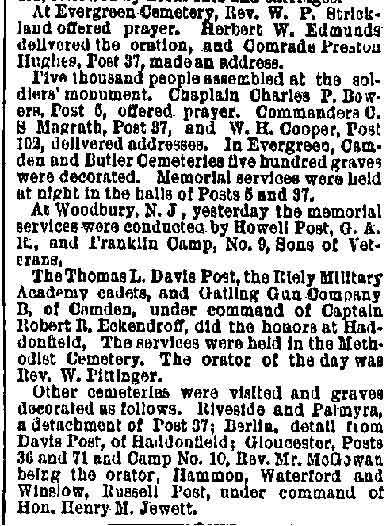 H. Gale, James Galbraith, Thomas Garman, Harry Garren, John W. Garwood, Josiah Garrison, John B. Gaskill, Richard Gaunt, Wm. German, Christopher Getsinger, Christopher Gifney, Jacob Giffens, Albert Gilbert, James Gillen, Wm. Giffins, C. C. Greany, Charles Green, W. H. Griffin, Louis Grosskops, William Grindrod, John B. Grubb, Mark H. Guest, John Guice, Alfred Haines, Charles G. Haines, Japhet Haines, George F. Hammond, Charles Hall, Solon B. Hankinson, Samuel P. Hankinson, James Hanson, Charles Hannans, H. A. Hartranft, Mahlon E. Harden, William F. Harper, George W. Hayter, Samuel B. Harbeson, J. T. Hazleton, H. Heinman, James Henderson, William H. Heward, Franklin Hewitt, James T. Hemmingway, Charles Hewitt, Edward K. Hess, Samuel B. Hickman, George Higgens, Ephraim Hillman, C. M. Hoagland, Guadaloupe Holl, William A. Holland, Isaac K. Horner, Count D. G. Hogan, William H. Howard, Baxter Howe, Alien Hubbs, Charles G. Hunsinger, Presmel D. Hughes, I. N. Hugg, Sebastian Hummell, Edward Hutchinson, C. Innes, Alfred Ivins, Benjamin Ivins, E. G. Jackson Sr., E. G. Jackson Jr., Thomas Jameson, George Jauss, William P. Jenkins, James L. Johnson, Alfred Jones, B. F. Jones, William Joline, Charles Joseph, Charles Justice, C. H. Kain, E. E. Kates, Benjamin Kebler, Frank Kebler, Peter Keen, Henry N. Killian, J. W. Kinsey, C. H. Knowlton, Thomas W. Krips, Joseph H. Large, John E. Leake, John Lecroy, Charles Leonhart, George W. Locke, E. J. Long, Charles L. Lukens, J. H. Lupton, Valentine Machemer, Edward Macloskey, Edward A. Martin, William P. Marsh, John Mapes, William Mead, William Metcalf, E. A. Meyer, C. Meyers, George Meilor, C. A. Michener, William B. E. Miller, Jacob Miller, W. D. Miller, Samuel Mills, William W. Mines, Christopher J. Mines, George Molesbury, William. Moran, Edward More, Richard Morgan, John F. Moore, S. H. Moyer, Jacob L. Morton, John Muir, John J. Murphy, Isaac Murray, Charles Myers, W. H. McAllister, James McCracken, Edward C. McDowell, Hugh McGrogan, H. M. Mcllvaine, W. F. McKillip, W.J.McNeir, Lewis McPherson, E. McPherson, Jacob Naglee, William Naphas, Antonio Nosardi, Robert O'Keefe, John S. Owens, Robert Owens, Edward H. Pancoast, James Pancoast, Robert B. Patterson, William Patterson, E. W. Pease, John B. Pepper, Joel Perrine, John Peterson, D. E. Peugh, Frederick Phile, Samuel B. Pine, William M. Pine, Adon Powell, John Powell, John Portz, J. 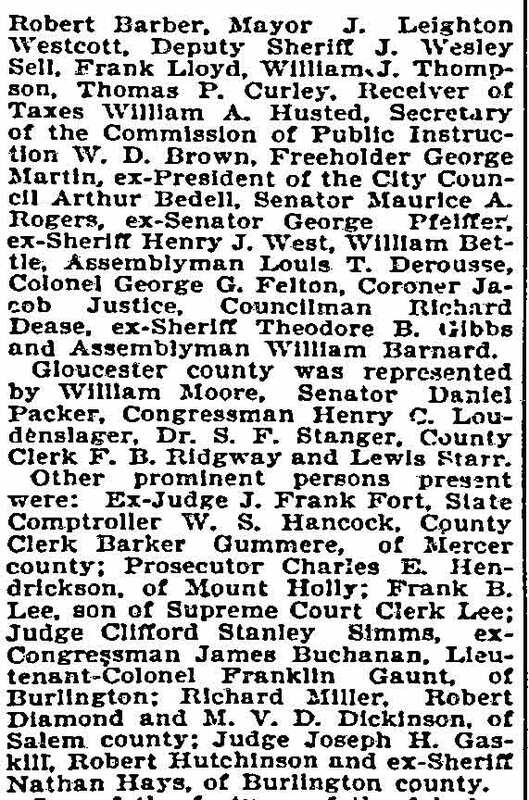 B. Prucelle, John Quick, S. E. Radcliffe, Isaac C. Randolph, James A. Regens, Philip Reilly, Charles P. Reynolds, Alexander Rhodes, Benjamin F. Richard, Andrew Ridgway, Benjamin Robbins, Edward C. Roberts, James Roberts, Richard J. Robertson, William B. Robertson, Isaac Rogers, John Rogers, William H. Rogers, Thomas G. Rowand, Sebastian Schaub, Maurice Schmidt, Christian K. Schallers, James Schofield, George W. Scott, John E. Scott, John M. Shemelia, Edward M. Siemers, John Simmons, Benjamin F. Shinn, Thomas Sheeran, James Shield, Charles Smith, George H. Smith, William W. Smith, Charles S. Small, Adolph Snow, W. Souder, Francis Senders, Robert Sparks, David C. Sprowl, Alfred L. Sparks, Abraham Springer, George W. Stewart, William L. Stevenson, Thomas G. Stephenson, Samuel R. Stockton, Thomas Stockton, Thomas H. Stone, Henry Strick, E. J. Strickland, Charles String, George F. Stull, George W. Swaney, Crosby Sweeten, William F. Tarr, William A. Tatem, Thomas S. Tanier, George Rudolph Tenner, Charles L. Test, Leonard Thomas, Benjamin Thomas, Henry C. Thomas, George F. Thorne, Wesley Thorn, Thomas W. Thornley, Alexander W. Titus, Joseph Tompkins, J. E. Troth, Isaac C. Toone, Samuel Tyier, Jacob M. Van Nest, Albert Vansciver, Joseph Wakeman, Theodore F. Walker, Charles Walton, George Walton, Joseph Welsh, David Watson, George W. Wentling, Edward West, Elmer M. West, George Weyman, Wilmer Whillden, James Whittaker, Samuel Wickward, Calvin T. Williams, George W. Williams, William H. Williams, John Williams, Samuel Winner, Amos P. Wilson, D.H. Wilson, G.A. 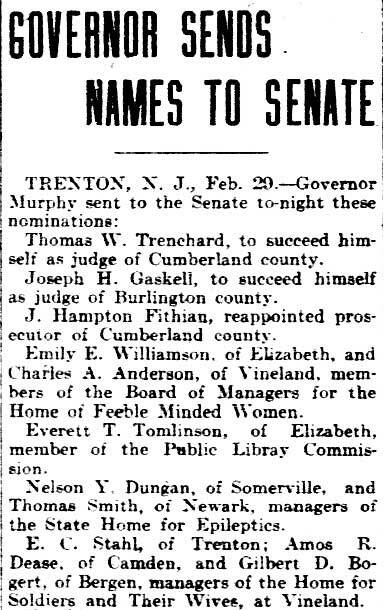 Wilson, Richard Wilson, George Wispert, John W. Wood, Joseph Woodfield, Walter Wolfkill, E. W. Wolverton, Elijah Worthington, C. M. Wright, George B. Wright, Henry S. Wright, Wesley T. Wright, William Zane. 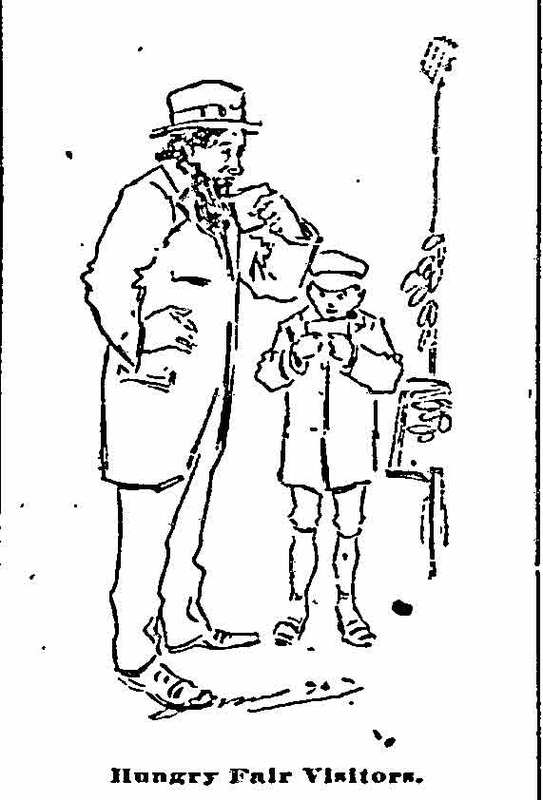 As of 1886, the Hatch Post met every Thursday evening in their own G. A. R. Hall, on Stevens Street, below Fifth Street. This same building had been used in the late 1870s as the original home of the congregation that formed the Tabernacle Baptist Church. 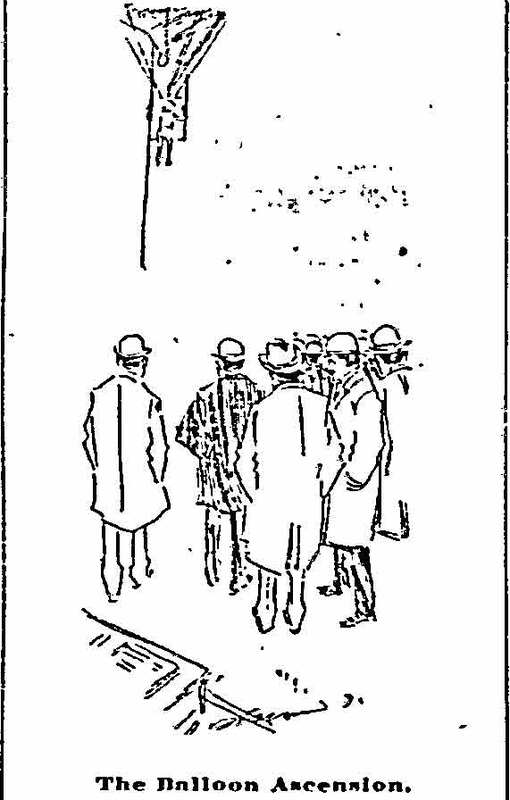 The Hatch Post was affiliated with Hatch League No. 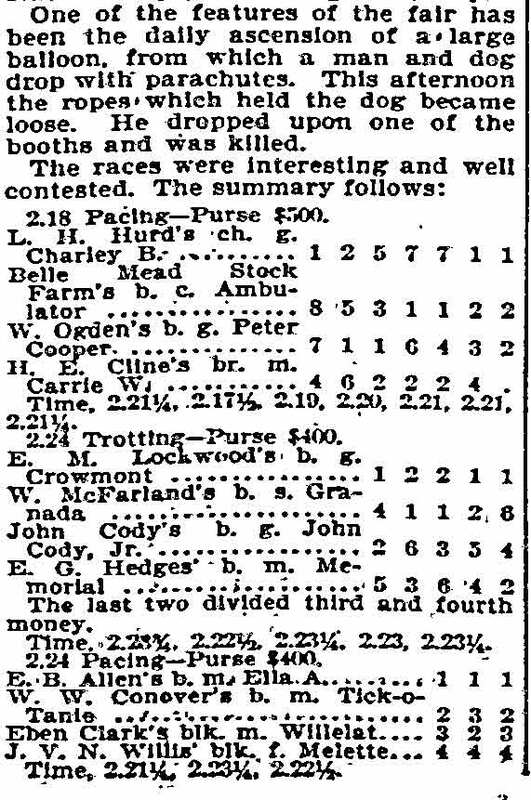 2, of the Loyal Ladies League, their auxiliary, which met at the Post Hall. Thomas M.K. Lee Post No. 5, G.A.R - William B. Hatch Post No. 37, G.A.R. George M. Robeson Post No. 51, G.A.R. 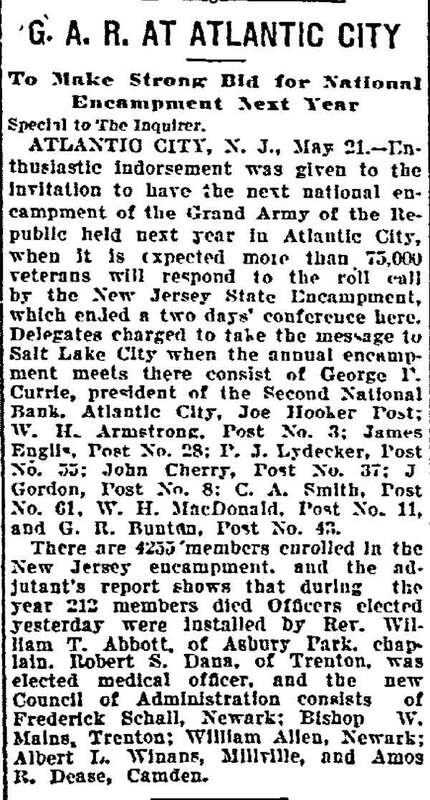 General John A. Logan Post 101, G.A.R. 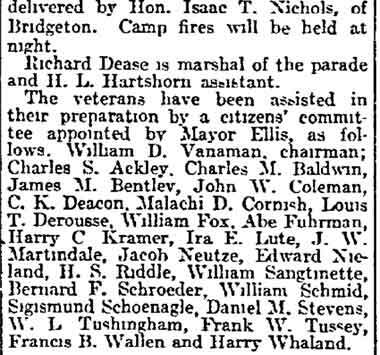 AMONG the prominent houses in this line may be mentioned that of Mr. A. R. Dease. This business was established by Dease & Sloan, about five years ago, Mr. Sloan retiring after the first six months. in consequence of ill-health. The store is about 20 x 30 feet in dimensions. A large stock of Paints, Oils, Varnishes, Leads, Brushes. and Painters' Materials is also kept. All kinds of House, Job and Sign Painting are attended to at the shortest notice. Mr. Dease is the owner of Excelsior Water-Proof Brick Coating, which is absolutely waterproof. Estate of RICHARD M. COOPER, DECEASED. The Excelsior WaterProof Brick preparation applied by A. R. Dease, 416 Market Street, Camden. to exterior brick work, has given satisfaction wherever he has used it for me, and appears an effectual cure for the white effervescence on bricks. I have used in my business as a builder, bricks treated with the Excelsior Water-Proof preparation, as applied by A. R. Dease, of Camden, New Jersey. I found it an excellent preparation for hardening bricks and rendering them impervious to dampness, and I have no hesitation in recommending it to the use of builders and owners for the purpose of obviating damp, and alkali discolored walls. 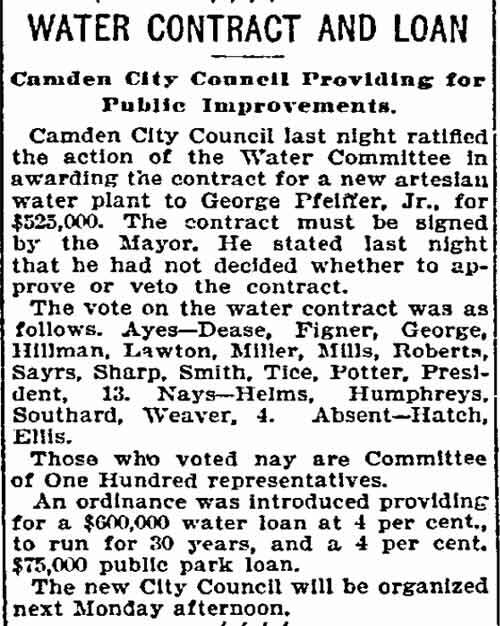 Building Inspector, Camden, N. J. We have used the E. W. P. B. C. on ten houses and it has given entire satisfaction, and we shall use it on all good houses that we will build hereafter. Fifteen skilled workmen are constantly employed. Mr. Dease is a native of Reading, but has been here for the last nineteen years. 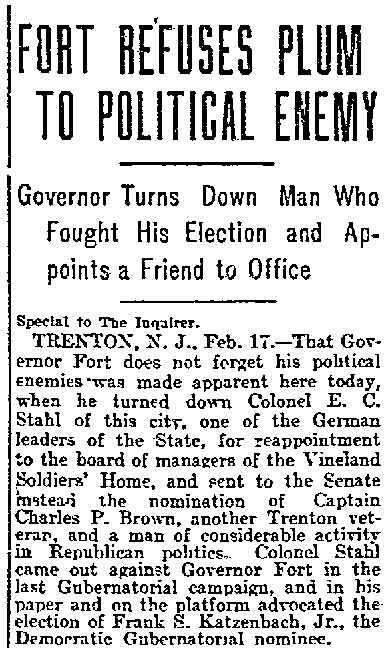 He was in the 128th Reg't Penna. 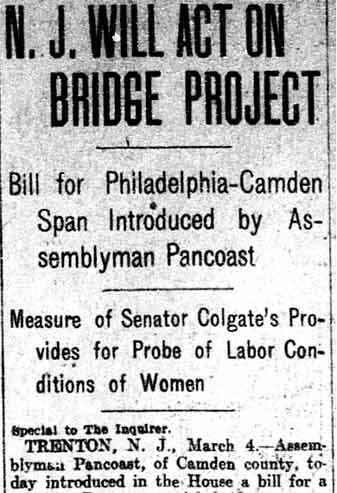 Volunteers, for nine months, and on the S. S. Powhatan for two years. 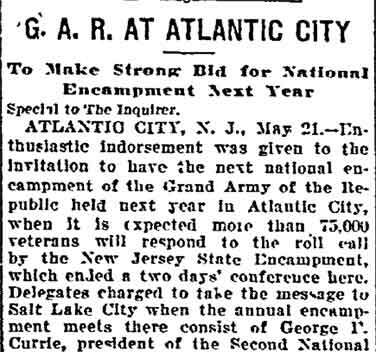 He is an active member of the G. A. R., and of the Masonic Fraternity. Amos Richard Dease - John A. Mather - Melbourne F. Middleton Jr.
Trimble Lodge, No. 117, F.& A.M.